The Cambodian capital had a much different vibe from quiet Siem Reap; it reminded me a lot of Taipei with all its greenery and claustrophobic streets. Upon arriving we had some free time, so the majority of the group went to check out the Royal Palace - a complex, really, of gilded, elegant structures with high peaked roofs and colorful embellishments. To my surprise it's still in use. The current king, at sixty-three, is still single and childless, so he will likely select one of his nephews to be his heir. Inclement weather slightly disrupted scheduled activities, but we still managed to squeeze in a cyclo tour around the city's main sights before departure. A 'cyclo' is essentially a bicycle with a seat for a single passenger affixed to the front. It was a bit nerve-wracking being in the face of honking traffic but our drivers proved most trustworthy. Side view of the Silver Pagoda at the Royal Palace. It gets its name from the thousands of silver tiles that comprise the floor, and houses Buddhas and other trinkets made from precious materials. 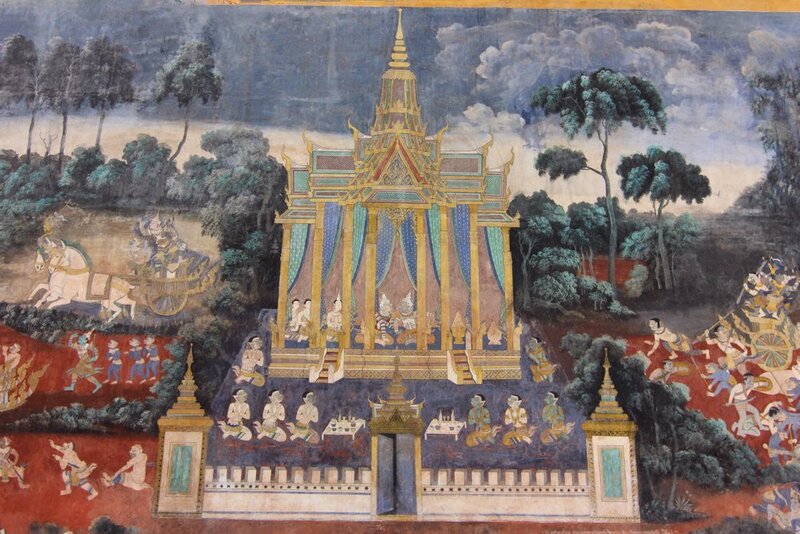 Detail of a restored portion of a mural at the Royal Palace. The cyclo drivers sizing us up. I had the sense that they were all jockeying to have me as their passenger because I was the smallest. This cheeky little boy was running around naked (don't worry, his mother was nearby) in the area that we stopped to admire the Independence Monument. A view of the parliament building on the left, ironically located just next to a casino (gambling is illegal).